I planned to post only Pasta recipes this week and I supposed to post 4th pasta recipe today. Due to some unavoidable personal work, I was not able to post the recipes on time over here. I prepared few pasta recipes recently and they are in the queue to come on line. I'll try to post them soon. Today's recipe is pasta based salad. I came to know about this salad only few years back from the menu card of my office canteen. The mixing would be done instantly in front of us and options of ingredients to mix with pasta would be given to us. I always pick the below combination whenever I go for salad. It is up to you, to mix extra ingredients like tomato, capsicum, other boiled pulses and so on. Also, they used salad dressing instead of curd. 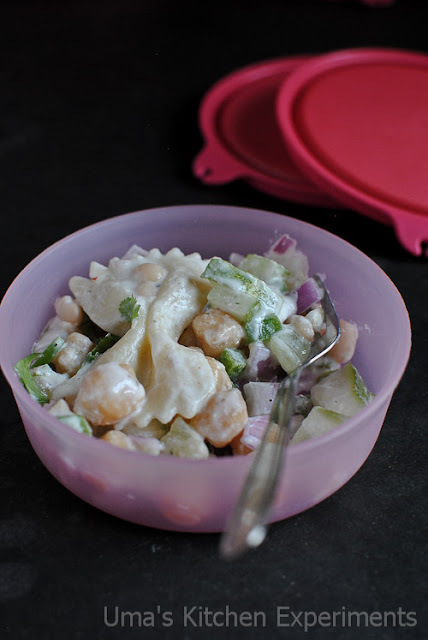 As I don't prefer salad dressing most of the time, I simply added thick curd for making this salad. 2) Add cucumber and onion. 3) Add boiled chickpeas and soybean. 5) Gently mix well without breaking pasta. 6) Taste and adjust the seasoning. 7) Garnish with coriander leaves and refrigerate till you serve. 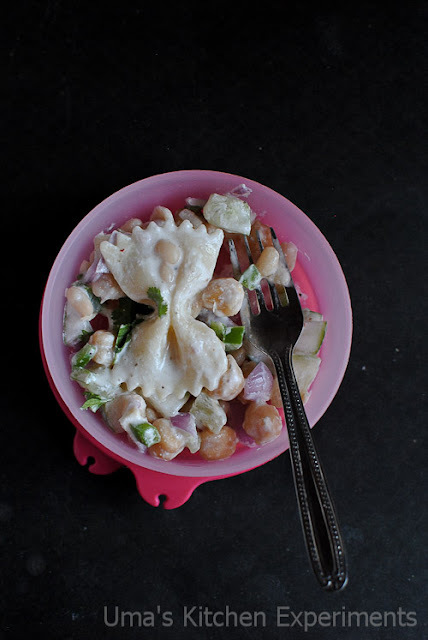 1) Use any type of pasta for making this salad. 2) If you prepare, you can add salad dressing. 3) Add additional nuts and boiled pulses if you prefer. 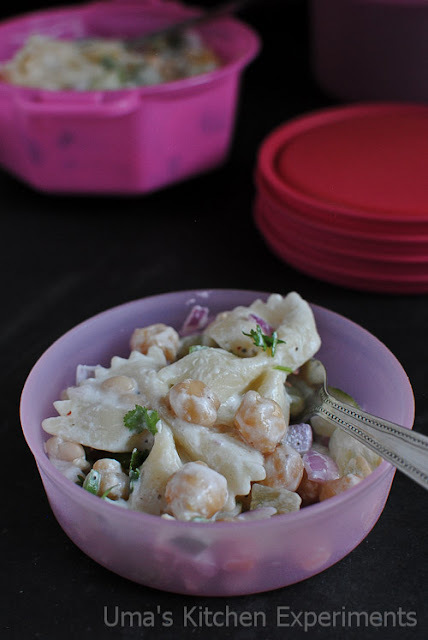 so filling and delicious pasta salad, great as a meal too...i usually make yogurt chickpea salad, addition of pasta make it even more filling n yummy! 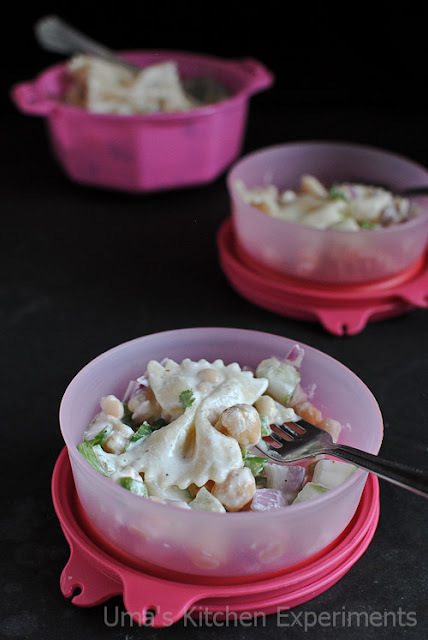 Inviting and healthy pasta salad dear. Instead of curd, we may use mayonnaise too. Surely try for this recipe soon. 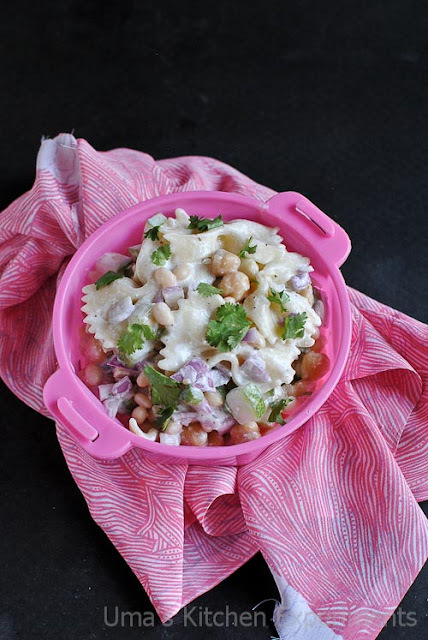 Never tried pasta in salad, would try it out.nice click. I had this salad once at my friends place. She has used apples, sweet corn, cucumber, onion, mayo and pepper. That tasted good Uma! Your version looks yum too! interesting salad,I too just posted a salad recipe!! I can have a huge bowl of this salad, quite filling and healthy too. so yummy and healthy salad!